If you play your cards right, these benefits boost retention (which saves you money on re-training), help your company recruit the most qualified candidates, and even cut down on insurance claims (which reduces your costs). And, your staff’s time can be spent more efficiently. The thing is, you won’t maximize these advantages if employees don’t know about their benefits or how to use them. That means you need an effective employee communication program to get the word out. Think about the millions you spend on healthcare alone (estimated to be $17,000 per employee each year on average), not counting other benefits and programs. If your employees don’t know about these benefits or appreciate them… it’s money thrown out the window. It’s said you have to spend money to make money. And that applies here too. It’s been our experience that, to be effective, you should budget about 1% of what you spend on your benefits on communicating those benefits to employees throughout the year – not just at open enrollment. Obviously, it’s not a one-size-fits-all approach. You have to look at several factors to calculate your exact magic number. When you contract with an insurance company to provide a group policy, part of the package is usually some sort of communications resources you can send to your employees. The same goes for well-being and other providers. For example, it might be one-sheet explaining the program or benefits you can mail out or post on your website. Sometimes you just don’t use them because they’re generic, and certainly not tailored to your company and your employees. They’re okay, but not exactly what you need. There is good news… some providers will give you an allowance (i.e. cash) you can use to hire a communications firm to create custom pieces specific to your company and your programs. Don’t be afraid to ask your provider about this arrangement – they won’t bite. 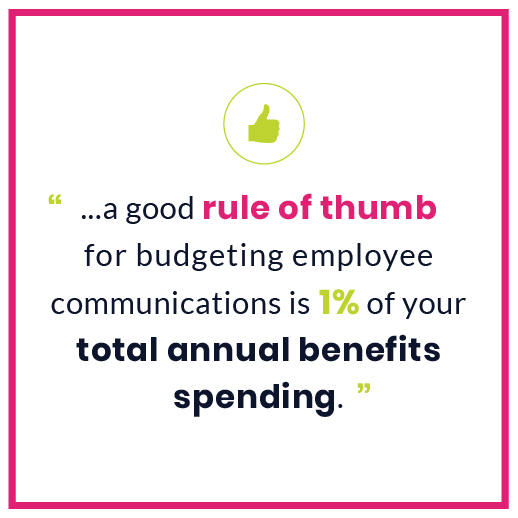 As mentioned previously, a good rule of thumb for budgeting employee communications is 1% of your total annual benefits spending. Economies of scale might allow a larger company with tens of thousands of employees to spend a smaller percentage compared to their overall benefits budget. A smaller company might pay a bit more. Either way, it’s a good rule of thumb. In our experience, a company with 1,000 employees can spend about $150,000 annually on an ongoing employee communication program that works well in engaging them in insurance coverage, well-being programs, and other benefits. That $150K is a drop in the bucket compared to the millions spent on the benefits themselves. And what good is spending millions on benefits if your employees don’t understand them, know how to use them – or even know that they exist? This is pretty obvious, but the more programs you have, the more you need to spend on informing your employees about those benefits. Insurance coverage usually dominates and gets the biggest chunk of the budget – appropriate when you consider how much it costs you. But it’s still important to get the word out about total rewards and compensation when on-boarding new employees or introducing a well-being program, for example. Don’t skimp. With one client we worked with, we helped educate employees about a program that included biometric screenings and a health assessment. The goal was to make employees aware of habits they could change to improve overall health. That could potentially mean less costly health insurance claims. In fact, if you eliminate just one high cost claim, a program like this could pay for itself. We used an aggressive multimedia campaign – including text messages, break room posters, home mailings, email blasts, marquee messages on their benefits administration platform, and more – to reach employees who were resistant to changing their health habits. The results: In year one, with a strong communication plan: 60% of employees and 40% of their spouses completed their screenings and health assessments. So, what about return on your investment in communication? That can potentially be huge! When you think of the cost of re-training an employee (estimated by the Center for American Progress to be 200% of their annual salary) or not being able to hire highly skilled employees that will contribute financially to your company, it’s clear that your relatively small investment in communication will pay off. With employees only staying in a job 1.5 years on average, according the US. Bureau of Labor Statistics, these are urgent concerns. Employees well informed about their insurance options and well-being programs are healthier. And those who clearly understand their total compensation are happier. That makes everybody more engaged all-round when they know their employer has provided these benefits. Not to mention these folks are more productive. It’s hard to quantify what that might mean for your bottom-line, but there it is. With Gallup reporting that 87% of employees are not engaged at work, this is definitely an issue, whether you know it or not. Numbers aside, investing in communications – and being proactive in letting employees know about their benefits – has another clear advantage. It allows you to create the company culture. You’re in the driver’s seat, so to speak, in making sure there is a positive “vibe” among employees regarding their benefits and their employer overall. If you don’t take steps to create a company culture, it’ll develop on its own – and you won’t have control over what it looks like. The danger here is that rumor and misinformation become the norm instead of the positive outlook about your company that should exist among employees… and that contributes to efficiency and productivity. This exercise is not about spending less necessarily, although that’s possible. It’s more about spending smarter and making the budget you’re given go the farthest it can. If you need help finding your magic number, you can get in touch with us at Spitfire.